Lone Iceberg floating in the glacier lagoon Jökulsárlón. 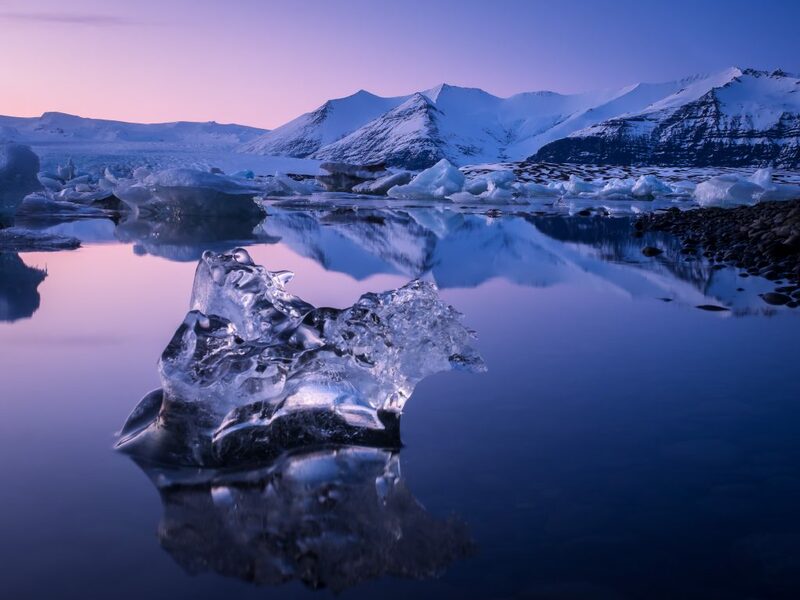 Jökulsárlón, better known as Glacier Lagoon is conveniently located just by Route 1, 380km East of Iceland’s capital Reykjavik. 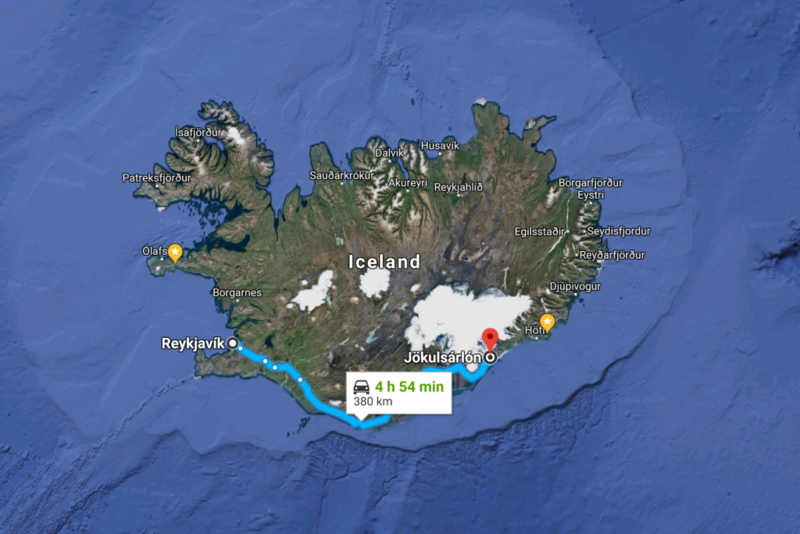 There are many option for travelers who wish to see the worlds most famous glacier lagoon, such as hiring a car and self driving, booking a coach, or catching the local bus from Strætó.is. The literal translation Jökulsarlon – Glacier Lagoon is a naturally formed lagoon filled with Ice Bergs which have calved from the glacial outlet Breiðamerkurjökull. Over the years Jökulsarlon has become an icon and is seen as the worlds interpretation of Iceland and it’s landscapes. 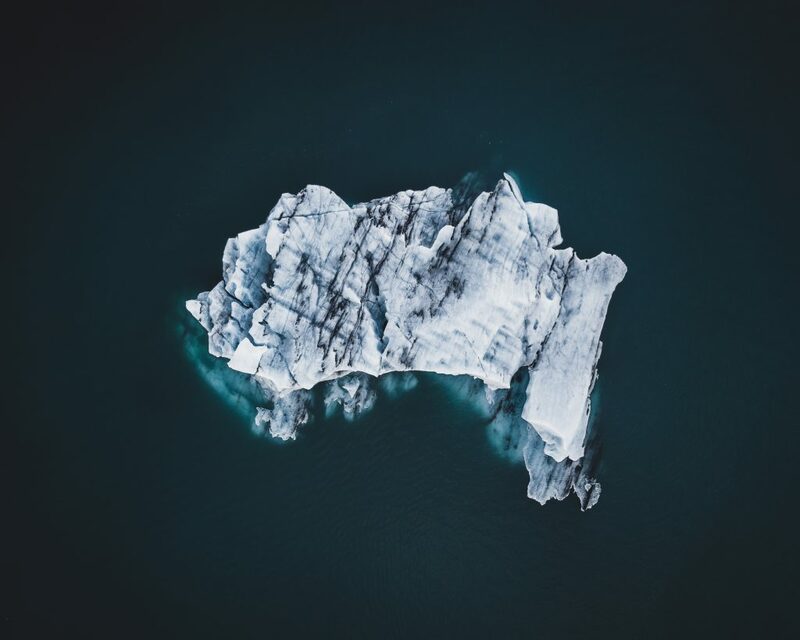 The lagoon offers visitors with stunning views of the surrounding glaciers, as well as an opportunity to get close and personal to the Ice monsters (Ice Bergs) floating in the lagoon only meters from shoreline. A true natural wonder, and a must see for everyone. As the glacier calves the ice breaks away from the glacier and begins it´s journey as an ice berg, where it can float within the lagoon waters for years and in some cases the ice bergs can drift out of the lagoon and into the ocean. 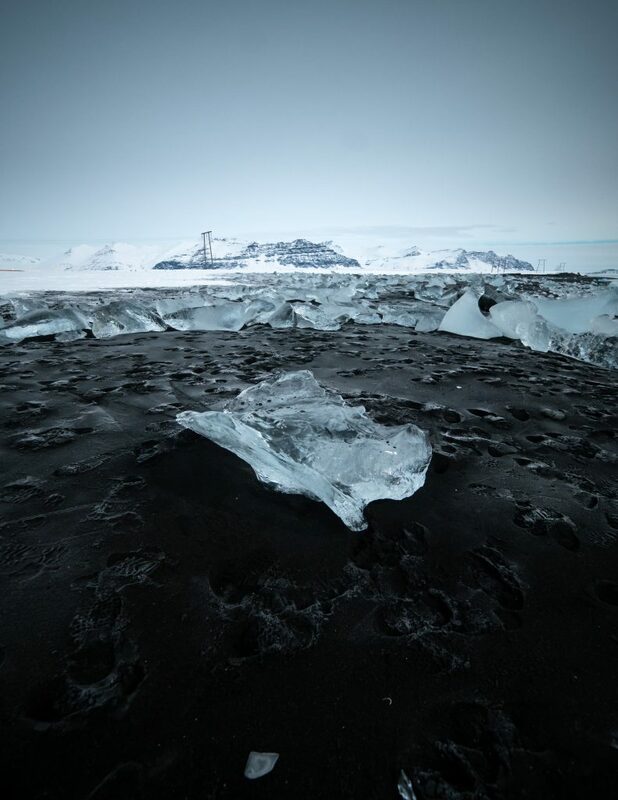 The shorelines of the lagoon are filled with growlers (small ice bergs) which contrast the black sands. The diversity in shapes, sizes, and colors is endless as each individual piece of ice is unique. As the glacier calves and retreats it changes the formation of the lagoon, due to this fact the depth of the lagoon is increasing. In 1998 the lagoons depth was recorded at 198 meters, and in 2006 the Jökulsarlon became officially recognised as Iceland’s deepest body of water at 248 meters. In 2018 the deepest part of the lake was discovered by the zodiac guides operating in the area and is now believed to be over 280 meters deep, this, however, is yet to been confirmed. 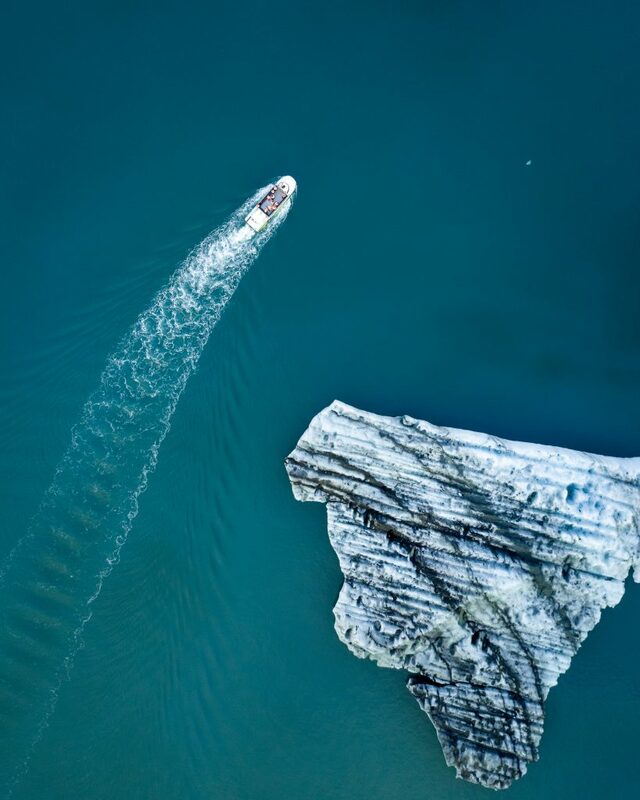 The long summer days offer more than just the magnificent midnight sunsets, it also means that typically the waters are calmer allowing small zodiacs and amphibian boats to run safe tours on the glacier lagoon. They usually last between 30-60 minutes and depending on which tour you choose, will take you all the way to the glacial wall where if lucky, you can witness the glacier calve. For more information about boat tours on the lagoon check out Glacier Lagoon. As the summer days seem endless, you could say something similar to the winter nights. This, however, opens a whole world of adventure and beauty for those brave enough to visit this winter wonderland. Apart from the all magical Aurora Borealis the winter months are also the only time to witness the world famous Ice caves. For more information about Ice Caves check out Ice Explorers. 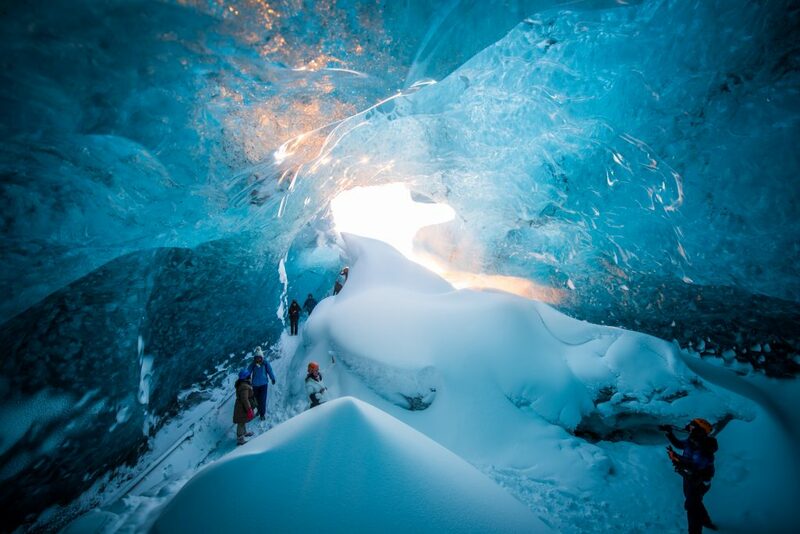 Crystal Ice cave in Iceland. The long black sand beach which is separated by inlet into the glacier lagoon Jökulsárlón, which allows the Ice Bergs and Growlers to feed into the ocean, which eventually either melt at sea or due to high tide and powerful waves are forced and stranded on the beach.